Here is another dessert recipe for my viewer. A delight for the winters. Pour 1 cup of boiling water over the almonds. Leave aside for 5 minutes. Drain and remove the skins of the almonds. Puree the almonds with 4 tablespoons of milk to a smooth paste in a blender. Heat the ghee in a non-stick kadhai and add the almond puree. Cook over a slow flame while stirring continuously till the mixture turns golden brown (approx. 15 minutes). Boil together the remaining milk with 4 tablespoons of water, add to the almond mixture and cook for 2 to 3 minutes. Add the sugar and cardamom powder and cook till the sugar has dissolved, while stirring continuously. 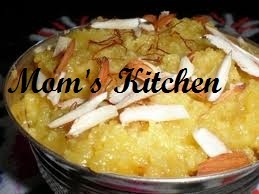 I like your badam halwa blog because into you have shared all Ingredients and how to make your instruction. this recipe has been like my mom when she is test your recipe.